I know these don’t look like much but take my word for it; these are the best brownies that you will EVER sink your teeth into (unless of course you don’t like peanut butter). Peanut Butter Brownies? you say. I realize that for some, a brownie is synonymous with chocolate but here at leggycooks we accept brownies of all shapes, sizes, and flavor profiles including the peanut butter sort. Don’t let their humble appearance fool you; these brownies are dangerously good. I usually bake them in a 13X9 pan, but then I end up looking at them as one large brownie and eating them all at once. To avoid brownie overload I baked this batch in muffin cups skipping that bothersome knife step and ensuring that my eyes don’t grow bigger than my stomach (sort of). The original recipe for these brownies is filled with loads of deliciousness including butter, p.b., sugar, and egg yolks. Since I can never limit myself to just one, or two, or three; I took a crack and making them slightly more friendly to the waist line, and i’m thrilled to say they remain tasty as ever. Make these for a special someone, for a birthday, or because you or someone you know is having a rough day. What i’m trying to say is these little guys will have you smiling from ear to ear so hurry up make them today! 1/4 c. butter at room temp. Grease a 13 x 9 pan or 24 muffin cups and preheat the oven to 350 degrees. In a large bowl combine the butter and peanut butter mixing until homogenous. If you are having a tough time getting them to blend pop the bowl into the microwave for 30 sec to loosen things up. Next add the yogurt and sugar and stir to combine. Add in the whole eggs and egg whites and mix for ~20 sec. Now add all the dry ingredients except for the chocolate chips. Mix until no large areas of flour are still visible and then add the chips. 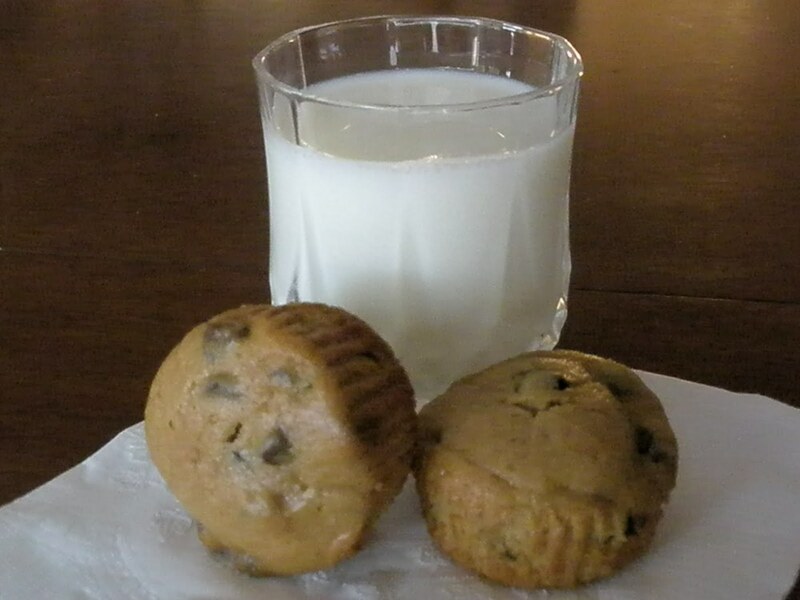 Briefly stir to distribute the chocolate and then spread into your prepared baking sheet or muffin cups. Bake for 25-30 min. if using a pan or 20 min if baking in cups. Cool in pan on wire racks for 20 then grab a glass of milk and enjoy. Next: Next post: Tomatillo-Pepita Gazpacho!